Damian is well-structured team consisting of interior designers for office, skilled artisans, dedicated workmen and experienced supervisors ensure the timely execution of projects given their extremely high stipulations. Damian has a portfolio of commendable works of renowned workspaces. One of their branch is present as Interior designers for office in Pune, where they have left no stone unturned in creating innovative interiors. No matter the size or stature of the project, presenting the client with a premium solution is the primary responsibility. 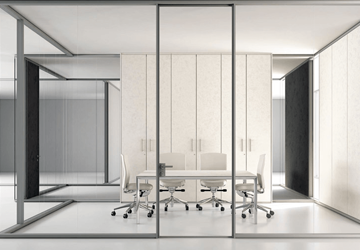 A glass partition can offer both an impressive and practical office division. The floor to ceiling height maximizes both light and natural space. 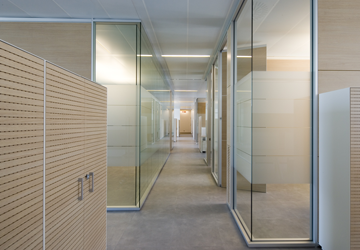 By installing a double glazed glass partition system you can be sure about having maximum soundproofing and visual qualities. Apart from Interior Designing Services, Damian manufactures and sells modular furnishing solutions. 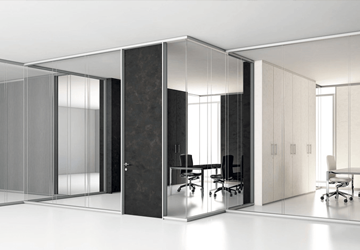 Out of which, EVOPLUS system is a double glazed office partition, ideal for interior offices, conference and meeting rooms and is an impressive alternative to single glazed partitions. The system comes with a top & bottom recessed skirting with 10 mm thick glass plates on either side. The linear joints between the glazed modules are provided with aluminum profiles sealed with high bonding double side adhesive tape. This system has a provision of a connection to a Dual Slab Partition and is provided with a leveling mechanism allowing a vertical adjustment of +/- 7.5 mm. It can also be offered with a Solid Panel on either side. 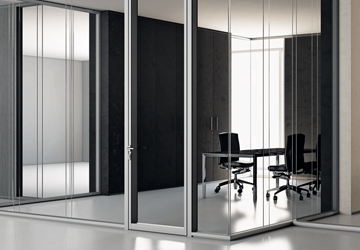 This partition system offers excellent sound insulation of up to 40 db.